After my grandfather's introduction to Derby Midland sometime during the mid to late 1960's it was not long before unaccompanied spotting trips were being made to the busy platforms at Derby Midland, especially during the summer months with their longer & usually warmer days. I still retain the notebooks created in those heady days, with their pages of neatly listed numbers, the cops usually marked by a red tick mark or a cross. The memories of specific days are just a blur but sifting through the numbers reveals the predominance of Peaks working through Derby in the early 1970's, both on the St Pancras workings and the more glamourous NE/SW route. Although the days of carrying headboards for the named trains was fading rapidly, the coaches frequently carried the throw away paper route descriptions listing all the towns and cities visited. In particular two named trains still identified were 'The Cornishman' and 'The Devonian', the names reeled off by the station announcer without a second thought, but for me sitting on a post office barrow clutching a one penny platform ticket, these place could well have been on Mars. And what of these locomotives and coaches, that started the morning catching the faint salt spray of Newquay or Penzance only to end their journey overlooking the North Sea at Newcastle or possibly all the way to Edinburgh. Had it always been this way? Steam had been gone for a couple of years, the infrastructure used to support it was rapidly disappearing, even the diesels and rolling stock were changing, blue was rapidly replacing green and for the coaches the post-Nationalisation regional colours were being devoured by BR's corporate blue and off white. Our journey starts in Edinburgh, which I've taken as the northern most point of the NE/SW route during the days of the Peaks. Initially the Peaks at Edinburgh were Holbeck based working over the Waverley route to Carlisle then over the Settle & Carlisle to Leeds, with some journeys going all the way to St Pancras, usually after an engine change at Leeds. In this view one of the earlier Peaks, equipped with gangway doors waits at Waverley for the right away towards Carlisle. (D11 - D15 were initially equipped with the gangway doors but these were soon removed as they went through Works). On June 14th 1961 D91 was noted working two round trips of empty vans over the Waverley route - between Carlisle & Hawick, seen as a precursor to the use of the Peaks on the Edinburgh - Leeds workings. BRCW Type 2's were also noted for the first time on certain Edinburgh Waverley - Carlisle services. At this time the Leeds - Glasgow St Enoch services led to the Peaks wandering over much of southern & central Scotland filling in between turns rather than laying idle at Polmadie or Corkerhill. They were frequently used on Perth and Dundee turns, both freight and passenger and were only too happy to make visits to the Ayrshire coast, always on the understanding that they would be back at St Enoch for the long overnight ride south. It seems that the Peaks sent up the Waverley route seemed to be less prone to straying away whilst laying over in the Edinburgh area. More Peak transfers came in February 1962 with D153 being allocated to St Margaret’s (64B). This locomotive was frequently used on the Edinburgh - Perth passenger turns, including one working throughout to Inverness, possibly on the seventeen coach 'Royal Highlander' north of Perth. Peaks were now reaching Edinburgh via the ECML on the 9.18am Newcastle - Edinburgh & 2.25pm return, noted were D22 on April 28th 1962 and D148 two days later. A shortage of Deltics on November 15th 1962 found the 7.50am & 9.40am Newcastle - Kings Cross being handled by D173 & D177 respectively. At Haymarket D178 was used for a while for crew training, by April 1963 the training locomotive had been swapped for D176. Another day excursion to Edinburgh draws to a close with a late afternoon visit to Haymarket. Its November 11th 1978 and the light is starting to fade as 45017 is captured on film. This locomotive was delivered as D23 to Derby in April 1961, it would be retired from Toton in August 1985. By the time of my expeditions north of the border passenger locomotives for Edinburgh Waverley services were dealt with by Haymarket depot, long gone were the days of St Margarets or Leith Central, 46036 is seen at Haymarket on June 18th 1978 waiting its next call of duty southwards. It was on a NE/SW working during March 1979 that this locomotive was involved in a serious collision near Lydney. Its about 630 rail miles to Penzance by the NE/SW route, initially the route will parallel the coast although glimpses of the North Sea will be rare. The first 125 miles to Newcastle are of an undulating nature, the substantial Royal Border bridge at Berwick provides impressive views of the Tweed, whilst Penmanshiel and Morpeth are locations remembered for railway tragedies, of collapsed tunnels and high speed derailments. Between Edinburgh & Newcastle the ECML ran close to the coast for a number of miles though only at a couple of locations was the North Sea briefly visible. One such location is seen here at Cockburnspath, some forty miles out of Edinburgh. A workstained D185 heads south through Cockburnspath on August 19th 1964 with a solid consist of some forty palletised wagons. The electrical characteristics of the Brush equipped Class 46's found them equally at home on passenger trains or the heavier freights, however they were not the equal of the Crompton Parkinson equipped Class 45's, particularly when operating in the higher speed range. After a couple of hours of passing through rolling green countryside the approaches to Newcastle brought a considerable change with heavy industry dominating the journey through the Newcastle area. The impressive station at Newcastle with its curved arched roof, one of three remaining on this route, would become a familiar haunt to the Peaks. Some thirty years prior to the arrival of the Peaks this station had no doubt witnessed the testing of the United Kingdom's first mixed traffic diesel electric locomotive, built by Armstrong Whitworth and powered by one of the first examples of the 'LDA' engine, in this case an 8LDA28. Newcastle would have a long association with the Peaks, particularly the Class 46's. As well as the NE/SW workings Gateshead's Class 46's would be a mainstay of the passenger services to Liverpool and less frequently the services to Kings Cross. Possibly the first Peak to visit Newcastle occurred on February 5th 1961 when Holbeck allocated D14 was sent north on a Neville Hill - Tyneside test train of fourteen bogies. Although the Peaks at Neville Hill had made occasional forays on the ECML they would soon become far more frequent following the transfer of D14 & D18 to Gateshead (52A) in September 1961, their stay here was brief being quickly replaced by three more Derby built Peaks. D18 was in charge of the 7.14pm York - Scarborough on September 2nd whilst the next day D14 had been noted at York in charge of the 11.25 Kings Cross - Glasgow. On 15th November 1961 D25 took part in high speed dynamometer car trials between Newcastle & Kings Cross. The load was ten coaches plus dynamometer car - 385 tons - allowed four hours seven minutes, Newark was passed three and a half minutes early. The next day a northbound trip was made leaving Kings Cross at 9.50am but to a slightly slower schedule. New loans to the region included D144 to Neville Hill (55H) and D146 to Gateshead (52A). During February 1962 D148 was loaned to Gateshead (52A), these loans would not be neccessary going forward as Gateshead would recieve brand new D166 - D170 in May & June 1962 and D175 - D193 between August 1962 and January 1963. Late in July 1962 Gateshead's D173 was loaned to Edge Hill, being noted on July 26th's 9.42am Newcastle - Liverpool, piloting D243. D170 would follow on September 8th, this time piloting D290 on the 3.16pm Newcastle - Liverpool, the Peaks were to take over some of the Trans-Pennine workings from the start of the winter timetable. The opening of the new Coventry cathedral during May 1962 drew many excursion trains to the city, on 25th D182 brought in a special from Newcastle. On January 3rd 1964 D29 failed at Newcastle working the 12.15pm Newcastle - Bristol leading to some entertaining events. D256 deputised, some thirty minutes late departing, however it was replaced at York by V2 60847, still about thirty minutes down. Handled by a Derby crew the twelve coach train was able to recover eight minutes despite a water stop at Sheffield. No replacement diesel was available at Derby so the Bristol crew taking over received some brief instructions from a locomotive inspector, the driver had never driven an LNER locomotive and this was the fireman’s first look at a V2. Quite how far 60847 got is not reported. Although Gateshead primarily supplied the locomotives for the Newcastle passenger workings the stock was serviced at Heaton. In this fine view an unidentified Class 46 & 47 are perhaps returning from Heaton to Gateshead having dropped off the coaching stock. A familiar view of an unidentified Peaks pulling out of Newcastle for the south-west. At the east end of the station 46041 stands on a gloomy April 29th 1978, presumably waiting to take the stock to Heaton. D178 was new to Gateshead early in October 1962, it was noted at Aberdeen on October 29th 1962! Withdrawal came in November 1981 followed by the inevitable trip to Swindon. To leave Newcastle on the NE/SW route required crossing the Tyne on one of several impressive bridges. Gateshead depot was situated south of the river surrounded by numerous junctions providing a variety of routes through the area. Once clear of Newcastle lay eighty miles of generally fast running through a mixture of industrial and rural landscapes before reaching York. With the impressive Durham Cathedral overshadowing the scene, 46048 prepares to restart the 16.28 Newcastle - Cardiff on June 21st 1977. 46048 would end its days during September 1981 after catching fire near Gloucester. Although Darlington was an important stop for the NE/SW services it was initially the locomotive workshops that proved of most interest as they would be responsible for the overhaul and repair of many diesel locomotive classes including the Peaks. During the middle of May 1961 D12 was noted awaiting works attention, possibly the first Peak to receive attention here? By the end of the year as many as half a dozen would be present for repair. (Unfortunately at this time I have no views of Peaks under repair in the Darlington Shops). Southwards from Darlington the rolling countryside of Tyne & Wear gave way to the undulating Vale of York with much of the route four tracked and relatively straight and level. Although the Peaks were no racehorses and their official maximum speed was less than that of the Class 47's it was over sections of track like this that the statistics didn't matter. Particularly with the Class 45's when given the chance they would keep up with the best of whatever was out there, and would frequently outperform the Class 47's. A fine early 1960's view of a West Country bound Class 45 hauled working arriving at Darlington. Looking at all those trolleys filled with packages and other items, its sometimes difficult to remember now just how much 'freight' was carried on the passenger services. Its early days for the Peak, the multipile working equipment is still fitted. Its the early afternoon on September 15th 1962 as D72 heads south out of Darlington station. The locomotive is barely two months out of Derby hence the shiny paint. If the train is southbound, is the headcode correct? A very grimy D41 heads north from Darlington on March 5th 1963, Salters Lane North bridge is in the immediate background. No doubt the 'Big Freeze' during the first quarter of 1963 had taken its toll on locomotive and train-washing facilities. The last Class 45 built, D137 wheels eleven coaches up the ECML, sometime in the mid-1960's. Its August 6th 1977 and 46005 is in charge of a relief Paignton - Newcastle working. This is the last summer in service for 46005, by November it will be stored at Laira, moved to Derby Works in December & scrapped by April 1978. But for now, here is one view portraying better times. The 09.50 Bristol - Newcastle cruises up the slow line near Thirsk on June 19th 1978 behind 46009. Delivered as D146 to Gateshead in December 1961 it would remain in service until October 1983 being withdrawn from Gateshead. 46032 passes Northallerton on the 16.23 Newcastle - Cardiff on August 6th 1977. 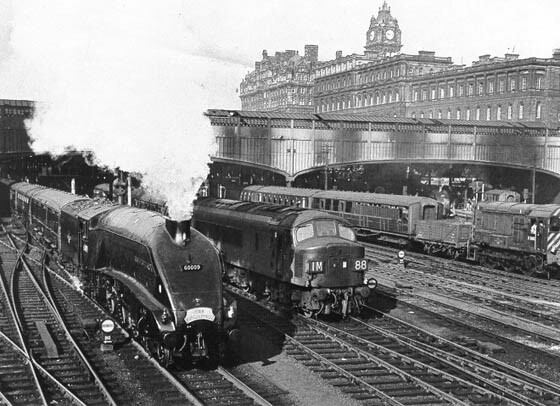 The high speed running across the northern part of the Vale of York was interrupted by the busy junctions and the station at York. An early turn used for training York crews on the Peaks was during May 1961 on the 8.05am Birmingham - Newcastle as far as York where the locomotive returned on the 2.24pm (12.43pm ex Newcastle) to Bristol. Another NE/SW service heads towards Newcastle on July 8th 1978 with 45001 in charge. D13 was one of the early visitors to the NE/SW route, one of the first to be allocated to Darnall (41A). Withdrawn in January 1986 this would be one of the Peaks broken up at MC Metals, Glasgow. 45002 cranks it up as it receives the right away from the platform staff, July 15th 1978. This was one of the Peaks to be transferred to Laira during 1969 for crew training, destined to replace the Warships in the West Country. Withdrawal came in September 1984. Also on July 15th 1978 45057 arrives from the south with a rake of Mark 1's. As D93 this was one of the Crewe built Peaks delivered to Barrow Road for use on the Bristol - Birmingham services. Withdrawal came in January 1985 with the end two years later at Berry's, Leicester. Although the Peaks grew up with the Mark 1 coach, the addition of electric train heating found them able to power the later Mark 2 fully air-conditioned stock, some of which is seen here July 25th 1981 on an Edinburgh service powered by named 45137. Photograph courtesy D Sainthouse. On March 4th 1987 45107 awaits time with the 06.14 York - Scarborough. This would be one of the Peaks active to the very end of regular working. As big as the Peaks were this scene of 45124 at York on April 13th 1987 certainly puts them into perspective. This was the first Class 45 to be refurbished at Crewe, being released from the Works during April 1982. It would be retired in January 1988 after catching fire at Leicester. Photographer unknown. Once clear of York the expresses to the south & west again had the ability to push their locomotives to the limit due to the straight and level track, again four tracked in many locations, as can be seen in the view below (location uncertain). An afternoon Newcastle - Liverpool services passes Colton on June 9th 1986 behind 45134. 46006 and its eleven coach train head south somewhere in the vicinity of York, date unknown. As D143 this was loaned to Saltley for crew training. This was also one of the 46's to be reinstated from Swindon for a brief period of further service from November 1981 to February 1982. 45070 rolls southbound through Church Fenton in the early afternoon of January 25th 1987. Four days after this date 45070 was withdrawn at Thornaby, though it would appear in June 1987 at Darlington as a technical exhibit. It had previously been withdrawn during April 1986 but survived a visit to Derby for replacement of the main generator. Unfortunately for the NE/SW services beyond Church Fenton the most direct routes towards Sheffield and the Midlands encountered a serious and ongoing by-product of the centuries of extensive coal mining in the area, that of subsidence. Although much freight traffic was generated by the area's coal industry the many speed restrictions placed over the routes in this area eventually led to the NE/SW passenger services taking the ECML as far as Doncaster before turning right towards Mexborough, Rotherham & Sheffield. After running some forty miles through the pleasant farmland of the Vale of York, and with the distant views of the North Yorkshire moors or the Pennines, it was quite a surprise to see the industrial scenery take over so quickly. The numerous coal mines with their ever present slag heaps and coating of coal dust appearing everywhere were separated by seemingly out of place patches of green containing the odd cow, horse or gypsy encampent. Lurking in the background and overshadowing everything were the huge cooling towers of several power stations. However the place that always stood out for me, perhaps because of its size, or perhaps because the old Midland route ran clean through the middle of it was the NCB coking plant at Wath upon Dearne. The place always seemed to be a hive of activity, the smell was unmistakable, and to pass by at night was a true visual feast, if Hell had a prototype then this place at night certainly conjured up many of its characteristics. One of the last green Class 46's, D165 cruises south under clear signals after having just passed the huge NCB facilities at Wath upon Dearne. One of the last two green 46's this machine received its last overhaul at Derby during 1979 and was withdrawn in May 1984 after catching fire whilst hauling a failed Newcastle - Plymouth HST. 46016 on April 8th 1977. This locomotive was one of the Haymarket training machines during February 1962, it reached Inverness on March 28th 1962 on the 'Royal Highlander'. It would finally succumb to wiring defects at Tyseley in December 1983 and be broken up at Swindon during August 1984. A Peak and its southbound train are held as a 8F 48151 rolls northwards through Swinton, possibly the 8F will head east onto the GC line towards Conisborough & Doncaster. After the delight of Wath's coking plant the industrial scenery grew even more varied, but was definately not recommended viewing at the best of times. To make the journey on a damp and dismal fading November evening with the day drawing to a close was to see industrial England at its bleakest. Canals filled with a variety of rubbish provided a back drop to a myriad of small industrial concerns, tar plants, wire works, endless scrapyards filled with rusting dismembered cars, the positive side being that most of these concerns were still rail connected with industrial & BR shunters frequently noted. The grimness of the landscape is captured somewhat in the views below, from the collection of Ron Healey as posted from time to time on 'abpr' & centered around the old Midland station in Rotherham. Its April 1961 and Holbeck allocated D21 takes the Sheffield line at Rotherham. This was the 700th diesel locomotive built at Derby and it was there on April 2nd 1986 working the 18.09 York - Birmingham that it would fail for the last time, being withdrawn five days later. An interesting perspective of an almost brand new Peak heading towards Sheffield at Holmes Jct during July 1961. Four decades on finds much rationalisation with more shrubbery and new houses but less railway, some of the houses built on the site of the yard on the approach to Rotherham station. DMU 150275 is about where the Peak is, though the perspective is distorted since the footbridge is now higher. April 2004. Note this is a large scan, 273k. This may not be a NE/SW working but it certainly is part of the route once travelled by the Peaks on those diagrams. Here D124 heads north from Rotherham in November 1961. A very grubby Class 45 approaches Holmes Jct sometime during June 1962. South Yorkshire at its finest, the line from Rotherham to Sheffield always seemed to depict the heart of the industrial revolution, with steel mills, coking plants, scrapyards and other industrial delights. Of course one must wonder who named one of the local station's ' Brightside'. 2004 again, the bridge in the middle distance and the house on the extreme right remain unchanged, but everything else seems to have had a makeover. DMU 158768 is just about to go under the footbridge on an unknown working. An unidentified Peak heads south towards Rotherham sometime during May 1963. After turning right at Rotherham the NE/SW services continued their trek through a landscape of decaying industrial concerns, sewage plants and giant steel rolling mills (with their associated scrap piles) that would make the name of Sheffield steel a worldwide quality name & product. The claustrophobic approach to Sheffield revealed that the undulating landscape was changing, Sheffield backs on to the Pennines, its growth had quickly filled the valleys of the Sheaf and its tributaries, the course of the railway dictated by geographical contours and prior development - not too many bright open spaces here, except for the character who named a local station 'Brightside'! An unidentified Class 45 on the approaches to Sheffield with a NE/SW service sometime during 1984. During January 1961 D13 was loaned to the Darnall (41A), to be followed in February by D12/15/16. In the first week of February D13 was used in a series of tests to establish load classification for freight train working for the new diesels. This was not over the NE/SW route but on the Highdyke iron ore trains. A less prestigous duty befell D42 on November 11th 1961 when it covered a morning Sheffield - York & return local working, normally a Class 2 2-6-0 job. The aftermath of the severe weather conditions often found bizarre combinations in service, one such was on February 25th 1963 when the 11.35am Sheffield - Nottingham DMU was replaced by D154 & 42636 with three coaches! 165 again, this time at Sheffield Midland caught in the shadows and as usual alongside one of the many bogs that seemed to be forever in the station. A dull February 10th 1979 finds 45008 giving plenty of evidence that its train heating boiler is up to the job. A Midland Ranger ticket purchased in late July 1972 found us using the same morning service to start the days adventures. The one morning a Class 47 showed up (1602) it failed at Saltley with loss of power, and 90 (45008) came to the rescue - Happy Days! In order for the NE/SW services to reach Sheffield they turned away from the easier more direct, but less populated route using the 'old Road' between Rotherham & Chesterfield. Consequently on leaving Sheffield the route provided a reasonable work out for the Peaks (five miles at 1 in 100) as they followed the River Sheaf until confronted with one of the remnants of the Derbyshire hills. Here the railway plunges into Bradway Tunnel, which also includes the summit of the line before making a swift descent towards Chesterfield. And as the distance from Sheffield increases so the view from the window reveals a greater mix of light industry and agriculture. Its early days for D70 as it heads away from Sheffield taking the Hope Valley route, date unknown. Not quite on the NE/SW route but definately an interesting Peak working. With the crooked spire of Chesterfield church dominating the scene 45029 cranks it up with the 11.42 Cardiff - Newcastle. Derby built 45029 was delivered as D30 to Neville Hille in May 1961 and remained in service, initially until January 1981. It was resurrected from store at Swindon in January 1982 for temporary use at Thorpe Marsh power station. It was noted at Doncaster Depot at the end of May 1982 and was eventually reinstated to Tinsley in August 1982. 45029 would remain in service for a further five years before retirement from Tinsley on July 28th 1987, when withdrawn it was in full working order with no reportable faults, its last classified repair had been at Derby during 1985. Like many others it was moved to March for storage, but because of it still being in working order it was reinstated in September 1987 and renumbered 97410. After retirement once more, 45029 eventually made its way to MC Metals, Glasgow scrapyard during October 1991 in the company of 45022. The Peaks are now long gone from this route, replaced by the equally impressive HST's, perhaps not so well loved by the enthusiasts as the machines they replaced, but they must merit a place in history, particularly in light of the second generation dmus that now roll along the lines with services that 45029 used to head up. But they all remain overshadowed by Chesterfield and its church. Under the alter at Holy Trinity Church lies the grave of George Stephenson, amongst many of his railway achievements was his supervision of the construction of the Midland line. He lived and died at nearby Tapton House. Just north of Clay Cross and not quite as impressive as the coking plant at Wath but equally as smelly and polluting was the large coking plant at Bolsover which dominated the area and provided much local freight traffic through Avenue sidings. 45014 is in the down loop at Clay Cross on June 5th 1979. The early Peaks traversing the Derby - Sheffield route were again primarily to be found on passenger workings, the freight workings were only dieselised once Toton and Tinsley received their full complement of diesels. 45014 ended its days after a collision at Chinley during March 1986. Its October 6th 1979 and 45038 cruises south towards Derby on an un-identified NE/SW working. Hey!! what can you say about Derby, its my home town so enough said. Sometime during September 1960 the first of the Class 45's entered service, D11 being allocated to Derby (17A) and D68 to Crewe (5A), the Crewe built machines tended to migrate towards Derby after their shakedown trials were complete. Although they were intended for service on the passenger expresses out of St Pancras it would not be too long (December 1960) before D14 was loaned to Leeds Holbeck (55A) but was worked out of Neville Hill for crew training. Despite the intention to principally work out of St Pancras these early Peaks did journey over small portions of the NE/SW route, mostly between Derby and Leeds. By the end of February 1961 the Peak diesel hauled passenger workings out of St Pancras included the services to Derby, Nottingham and Leeds as well as almost total control of those to Manchester. Time has marched on, the train services are still there but the Class 46's have been gone from the NE/SW route for a decade. But here on February 3rd 1994 D172 is at platform six at Derby (with 47809) operating as a 'main line certified' locomotive in the post British Rail world. Photograph courtesy A Healey/J Glynn. A work weary 46012 pauses at Derby on July 30th 1978. Close inspection of the panelwork behind the cab revealed considerable rust held together with blue paint. This was one of the earlier Class 46 withdrawals, suffering a cracked frame in the summer of 1980. 46038 has just been removed from a northbound working, failed due to a minor fault, at least the locomotive was able to reach somewhere that could provide assistance without blocking the mainline, June 16th 1979. Another lazy summer Saturday spent at Derby finds the usual procession of NE/SW expresses in the hand of the Peaks & Class 47's. Here is 46054 with a nice leak about the radiator pulling into platform 4 on August 4th 1978. By the time Birmingham was reached an Edinburgh - Penzance service would be now just over half way through its journey. Again the traveller would be greeted by increasingly industrial scene particularly after passing Hams Hall power station. As with the approach to Sheffield the approach from the north east presented one of the more built up, gritty sides of the city. The final entry into New Street was one of viaducts, cuttings and noisy tunnels and of a modern station leaving much to be desired. No longer a cathedral to Victorian engineering, now a developers plan for the maximisation of office and retail space with a station in the basement. Possibly one of the first Peaks to visit the Birmingham area was Derby's 700th diesel, D21 delivered to traffic during March 1961 and being noted at Saltley for crew training on 12th. D91 soon followed for crew training, two turns left Saltley at 9.40am & 11.20am running via Castle Bromwich and Aldridge. Other Peaks noted in the Birmingham area were arriving on 5.20pm passenger Derby - Birmingham, returning north next morning on the 8.05am Birmingham - Newcastle as far as York where the locomotive returns on the 2.24pm (12.43pm ex Newcastle) to Bristol, this latter turn being for the training of York crews. January 22nd 1976 finds 45011 & 46043 sitting in the sun at Saltley. Although not too many NE/SW services started/ended at Birmingham, many changed locomotives here, particularly those from Liverpool/Manchester and those to the Southern Region via Reading. Saltley would generally service such locomotives. Peak transfers during 1965 were pretty much limited to the shuffling of a small number of locomotives between the LMR depots throughout the year. However during March four Peaks were transferred to Saltley (2E), they returned to the Midland Lines (ML) during May. Entering New Street from the south-west is 160 on May 31st 1973. It is about half way through its working life, ending its days at the Research Department as a back-up to 46045 (97404). A rainy Saturday lunch time on March 26th 1977 finds two Peaks on adjacent platforms. Locomotives awaiting their next turn of duty were always a regular feature at New Street, particular with the services to/from the Manchester/Liverpool area, being brought in by electric traction & leaving behind diesels. 45061 16 June 79. 45006 'Honourable Artillery Company' drops down on to a working just arrived from Liverpool/Manchester on August 1st 1978. The locomotive received its name at a station not known for its diesel activity, that of Broad Street on June 9th 1965. It was retired at Toton in September 1986 due to its poor condition & general unreliability - it was worn out!